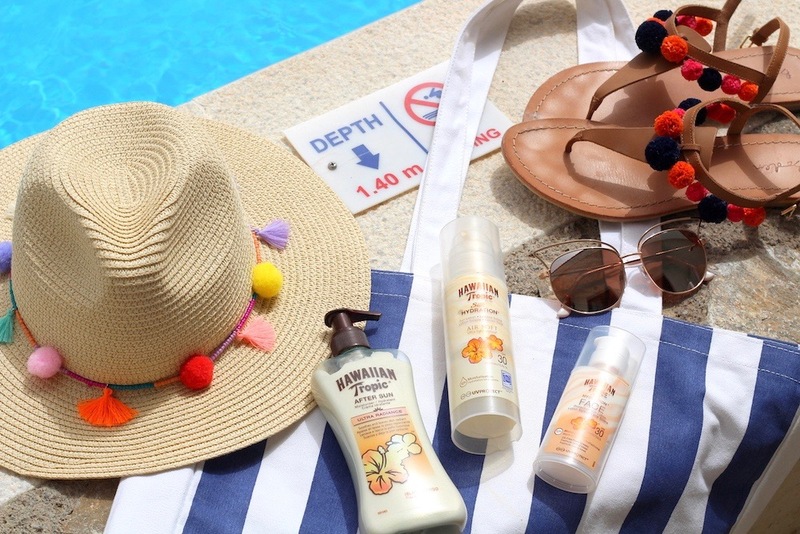 I'm sure we're all aware of just how important staying safe in the sun is, unsurprisingly, any holiday abroad involving sun leads to a frenzy choosing which SPF to pack whilst questioning just how many hats I can take with me in-flight and asking myself whether 5 pairs of sunglasses for a 5 day trip is really necessary. I don't know if this is an old wives tale or if it's really something you should stick to but I've always made sure my head stays out of the sun. Whether I've got my head in the shade or I'm wearing a hat, I try my best to avoid direct sunshine on my head. Keeping your skin looking younger and the lower the level of sun exposure the better in terms of thinking ahead, wrinkles are a consequence of too much time in the sun. To tackle this I find what I love; I've been obsessed with straw hats in the summer for quite some time so I take it as the perfect excuse to grab some more, keeping my head shielded from the sun whilst looking pretty in photos! This year it's all about the pom pom trend so of course I had to get my hands on a pom pom hat, this one made it into my wishlist instantly. I struggle when it comes to finding the perfect pair of sunglasses, I always have; I've got a small head and often find sunglasses to be far too big on me and drown my little head rather than help frame it. Needless to say, when I find a pair that suit me and I like I'm all over them! That's exactly what happened with these mirrored sunglasses from Topshop, they have an incredible mirrored lens (which although I love can be so inconvenient in photos!) and are just so chic. 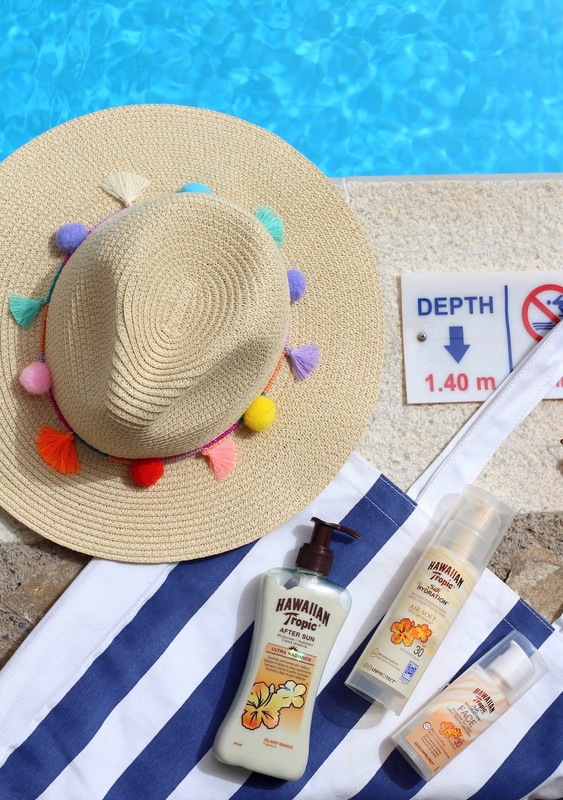 An obvious essential when you're travelling anywhere hot is SPF. On this trip I brought some Hawaiian Tropics with me, I don't think I've ever used their suncream which is quite surprising as I religiously pick up their tanning oils (although I didn't pack any for this trip). I've got the silk hydration range for the body and face as well as some after sun which adds a gorgeous glow to the skin and is perfect in the evenings. Finally, and quite an important one that I think is often overlooked: keeping a track of time is essential. The sun is strongest between midday to 3PM so avoiding too much exposure during those hours is ideal. 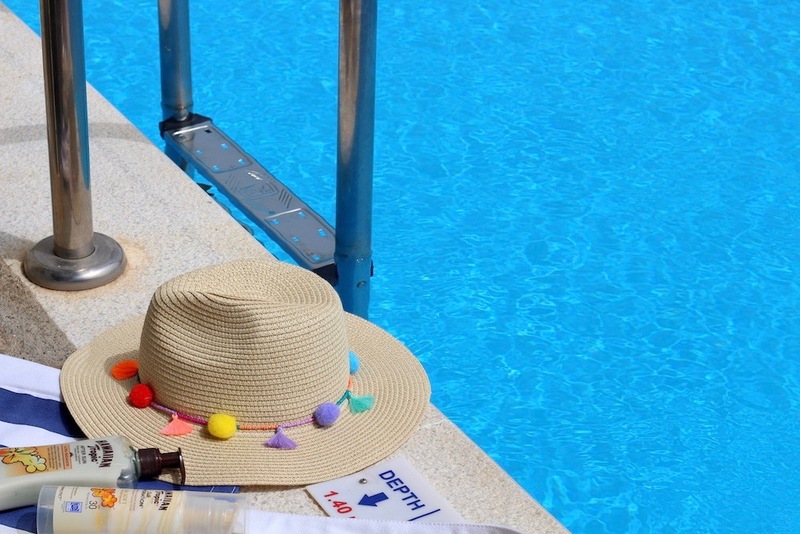 Whether you're sitting by the pool or at the beach, choose to stay in the shade for a while or if you'd rather avoid the sun completely then you can stay indoors, head to lunch and freshen up before heading back out - that's what I like to do. What are your tips for staying safe in the sun?